The U.S. Department of Labor announced this morning that the economy added over 200,000 jobs last month, a sign that the economy continues to improve. It’s not all rainbows and unicorns, though. 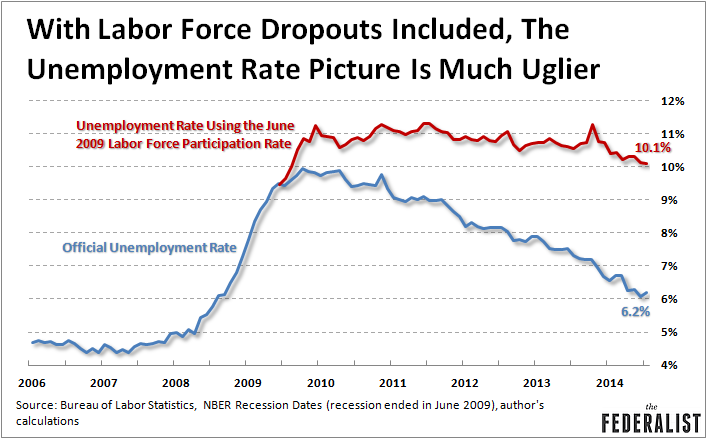 The unemployment rate, which ticked up to 6.2 percent, remains artificially low due to the percentage of people who have dropped out of the labor force since the recession officially ended in June of 2009. In June of 2009, over 65 percent of the working age population was in the labor force: that means they were either employed or looking for jobs. But today, that number is still stuck south of 63 percent. That means a lot of people who would otherwise be working or at least looking for work are no longer counted in the official unemployment rate. If you hold the labor force participation rate constant at the same percentage it was at the end of the recession — 65.7 percent — the unemployment rate jumps from the official 6.2 percent to a less encouraging 10.1 percent.